Is The Travelers Companies Inc (NYSE:TRV) A Good Stock To Buy? Many investors, including Paul Tudor Jones or Stan Druckenmiller, have been saying before the Q4 market crash that the stock market is overvalued due to a low interest rate environment that leads to companies swapping their equity for debt and focusing mostly on short-term performance such as beating the quarterly earnings estimates. In the fourth quarter, many investors lost money due to unpredictable events such as the sudden increase in long-term interest rates and unintended consequences of the trade war with China. Nevertheless, many of the stocks that tanked in the fourth quarter still sport strong fundamentals and their decline was more related to the general market sentiment rather than their individual performance and hedge funds kept their bullish stance. In this article we will find out how hedge fund sentiment to The Travelers Companies Inc (NYSE:TRV) changed recently. Is The Travelers Companies Inc (NYSE:TRV) a healthy stock for your portfolio? The best stock pickers are betting on the stock. The number of long hedge fund bets inched up by 3 recently. 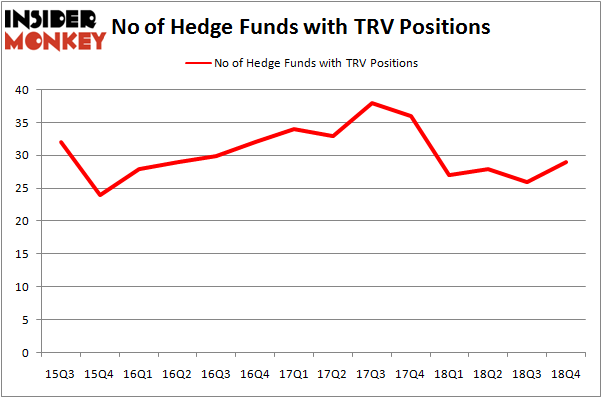 Our calculations also showed that TRV isn’t among the 30 most popular stocks among hedge funds. Let’s take a glance at the recent hedge fund action surrounding The Travelers Companies Inc (NYSE:TRV). Heading into the first quarter of 2019, a total of 29 of the hedge funds tracked by Insider Monkey were bullish on this stock, a change of 12% from the second quarter of 2018. By comparison, 27 hedge funds held shares or bullish call options in TRV a year ago. So, let’s see which hedge funds were among the top holders of the stock and which hedge funds were making big moves. Among these funds, Berkshire Hathaway held the most valuable stake in The Travelers Companies Inc (NYSE:TRV), which was worth $713.5 million at the end of the third quarter. On the second spot was AQR Capital Management which amassed $155.5 million worth of shares. Moreover, Arrowstreet Capital, Two Sigma Advisors, and Polar Capital were also bullish on The Travelers Companies Inc (NYSE:TRV), allocating a large percentage of their portfolios to this stock. As industrywide interest jumped, specific money managers were breaking ground themselves. Interval Partners, managed by Gregg Moskowitz, created the most outsized position in The Travelers Companies Inc (NYSE:TRV). Interval Partners had $4.1 million invested in the company at the end of the quarter. Brandon Haley’s Holocene Advisors also made a $2.6 million investment in the stock during the quarter. 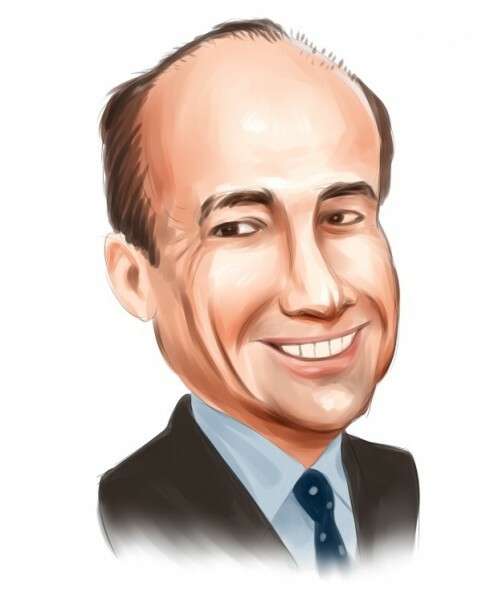 The other funds with new positions in the stock are Joel Greenblatt’s Gotham Asset Management, Dmitry Balyasny’s Balyasny Asset Management, and Claes Fornell’s CSat Investment Advisory. Let’s also examine hedge fund activity in other stocks – not necessarily in the same industry as The Travelers Companies Inc (NYSE:TRV) but similarly valued. We will take a look at Applied Materials, Inc. (NASDAQ:AMAT), Red Hat, Inc. (NYSE:RHT), NetEase, Inc (NASDAQ:NTES), and Ross Stores, Inc. (NASDAQ:ROST). This group of stocks’ market caps match TRV’s market cap. As you can see these stocks had an average of 41.25 hedge funds with bullish positions and the average amount invested in these stocks was $2471 million. That figure was $1226 million in TRV’s case. Red Hat, Inc. (NYSE:RHT) is the most popular stock in this table. On the other hand NetEase, Inc (NASDAQ:NTES) is the least popular one with only 27 bullish hedge fund positions. The Travelers Companies Inc (NYSE:TRV) is not the least popular stock in this group but hedge fund interest is still below average. This is a slightly negative signal and we’d rather spend our time researching stocks that hedge funds are piling on. Our calculations showed that top 15 most popular stocks among hedge funds returned 19.7% through March 15th and outperformed the S&P 500 ETF (SPY) by 6.6 percentage points. Unfortunately TRV wasn’t in this group. Hedge funds that bet on TRV were disappointed as the stock returned 12.7% and underperformed the market. If you are interested in investing in large cap stocks, you should check out the top 15 hedge fund stocks as 13 of these outperformed the market. Were Hedge Funds Right About Selling Northrop Grumman Corporation (NOC)? Is Illinois Tool Works Inc. (ITW) A Good Stock To Buy? Were Hedge Funds Right About Dumping FedEx Corporation (FDX)? Is Vertex Pharmaceuticals Incorporated (VRTX) A Good Stock To Buy? Were Hedge Funds Right About Ecolab Inc. (ECL)? Were Hedge Funds Right About Getting Into Bank of Montreal (BMO)?